endocrinologists and Internists managing diabetes and cardiometabolic diseases from the Asia-Pacific region. Diabetes is one of the largest and alarming health emergency of the 21st century. The management of diabetes and its complications is a big challenge considering the complexity of diabetes, cardiovascular pathophysiology and the frailty of patients affected by cardiometabolic diseases. Only a deep knowledge of the mechanisms underlying the disease and of the complex available pharmacology will allow tackling this global health emergency. According to the World Health Organization high blood pressure is the highest risk factor for premature mortality, followed by tobacco use and high blood glucose. Effective treatment of hypertension is thus essential to reduce cardiovascular complications. Taken together, hypertension and diabetes share common pathophysiologic mechanisms, health outcomes and clinical issues that are often tough tasks to face in clinical practice. EXCEMED is involved in a comprehensive educational programme to increase knowledge in cardiovascular diseases. The conference will address the most recent advancements of research in the areas of cardiometabolic medicine and, in particular, will discuss the best approaches for clinical management of the complexity of cardiometabolic patients in daily practice. 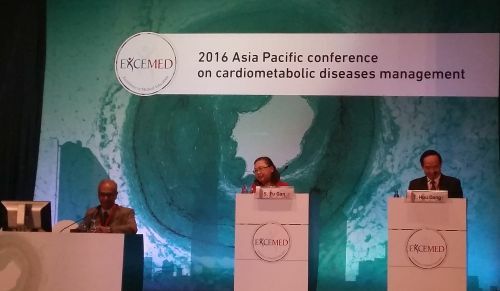 The EXCEMED “2016 Asia Pacific conference on cardiometabolic diseases management ” held on 23-24 April 2016 in Ho Chi Minh City, Vietnam is designed for a maximum of 9 (nine) hours or European CME credits (ECMEC). High heart rate in cardiovascular diseases: Is there clinical evidence for a benefit of heart rate reduction?